Have you held a crisp banknote up to the light to see a President or Monarch peering back at you, or did you notice a crest or a maker’s name on a piece of high-end stationary? Watermarks add beauty, security, and a physical link to the maker. Watermarks are areas in the paper that are thicker or thinner, thus transmitting light differently than, the the surrounding paper. The term watermark refers to its application while the paper is wet. (Note that many modern security papers, such as checks and prescription pads, carry artificial watermarks; these are applied to the surface of the paper and are not the same as those found on antique papers.) The first watermark dates to 1282 Italy. When making paper in, say, 1824 (see the example below), a slurry of cotton fibers from pulverized rags was poured over a wire mesh, pressed, and dried–this is termed laid paper. As the cotton pulp was pressed against the mesh, it would assume the pattern of the wire mesh in reverse; these papers take on characteristic chain lines and laid lines. Chain lines run across the mould, parallel to the short side, and laid lines run the length of the mould, spaced more narrowly than laid lines (these are not a watermark, they are an artifact of paper making, but can be used in identifying the paper). Any additional wire placed on the mesh would leave a corresponding thin area on the dried paper. The laid paper used for Alturas (to be discussed in a future post), has chain lines running top to bottom and laid lines running left to right (ignore the sharp black lines, these are part of the image on the page). These lines can be identified be the space between them–chain lines are relatively far apart, laid lines much closer together. 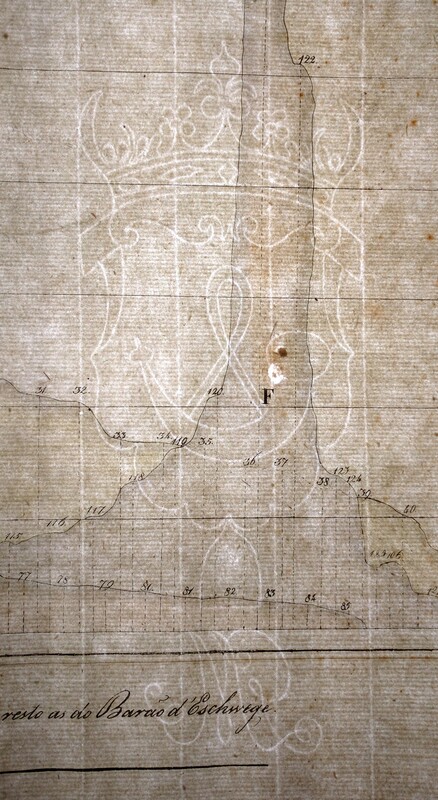 An ornate watermark of a trumpet inside a crest above the letter M sits on one half of the sheet of paper. What is the crest? Perhaps indicative of the paper maker. Maybe the M indicates the page size. As I use online databases to investigate the origin of this paper I will keep you apprised.